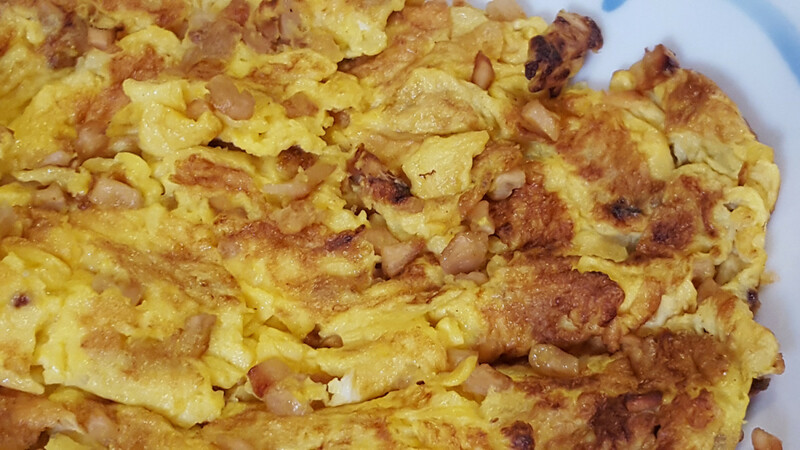 My mother was an excellent cook who taught me childhood lessons in the kitchen as she cooked from scratch. My hubby & I both enjoy cooking. 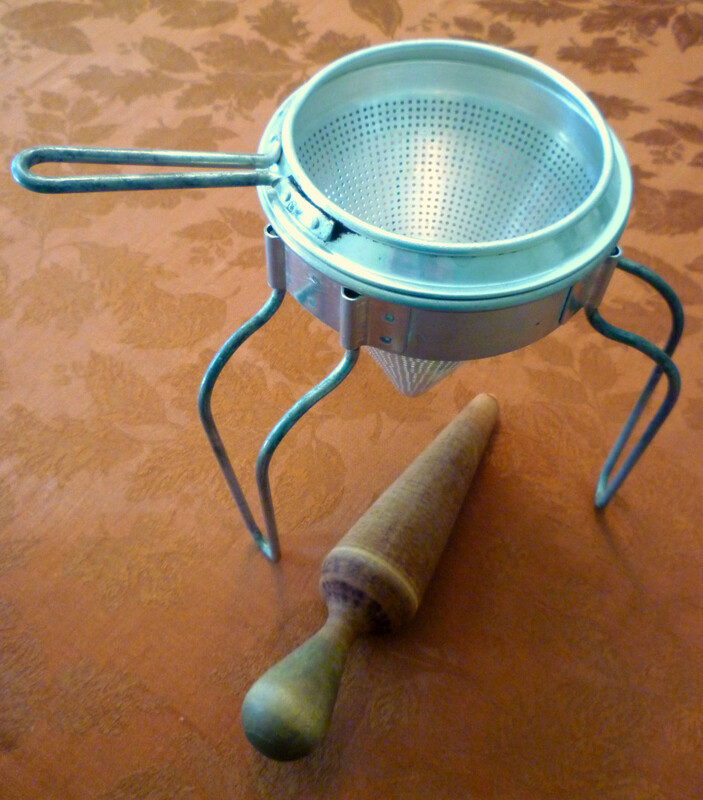 My grandmother gave me an old-fashioned cone-shaped food mill/grinding mill strainer with stand and a wooden pestle. That was when my husband and I moved to Wisconsin Rapids, Wisconsin, from Houston, Texas, in the 1970s. It was definitely put to good use! I made many a pint jar of home-canned choke cherry jelly. Numerous quart jars were also filled after making applesauce. Preservation was done by using water-bath canning methods. My grandmother had given us her old canning equipment and plenty of old-but-still-useful mason jars that were in her basement. Another type of vintage food mill was also in my possession given to me from my family. The stand on this Wearever old-fashioned aluminum food mill nicely placed the cone strainer over bowls which could easily capture the pressed juice and ground pulp of the fruit. This became my favorite choice to use. This is modern but similar to the old fashioned food mill given to me by my grandmother. 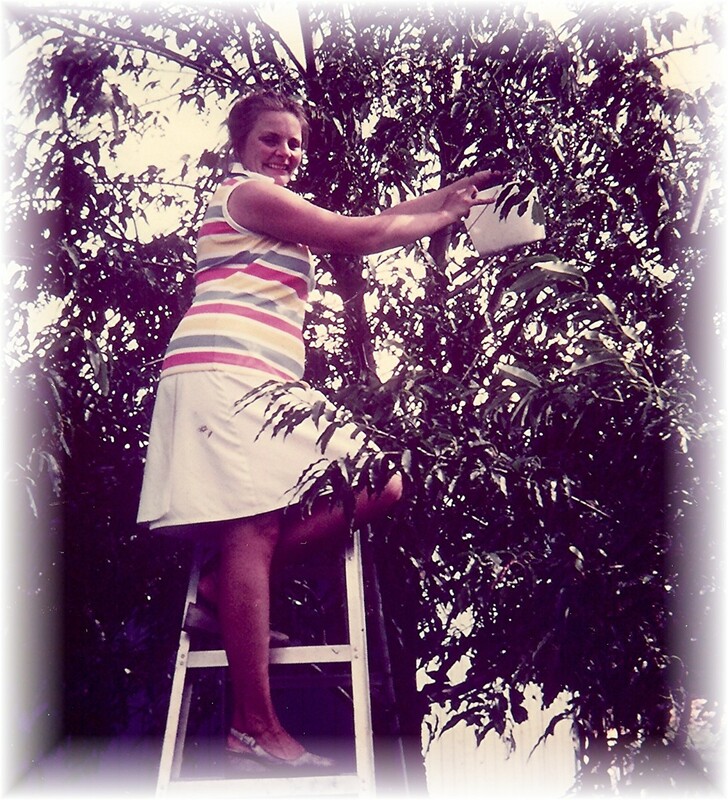 I practiced backyard organic gardening when my husband and I lived in Wisconsin Rapids, Wisconsin, many years ago. That garden was terrific and produced so much nutritious and tasty food not only for the two of us but we shared it with many other people as well. One of our good neighbors who had several acres of land and their own large garden invited me to split the purchase of several bushels of different types of apples one year. 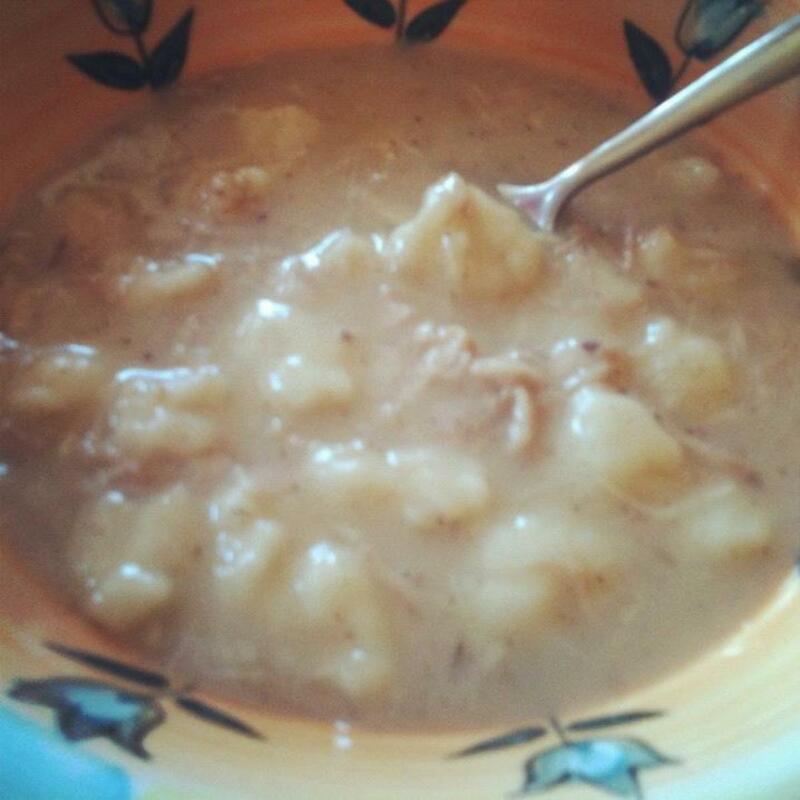 She regularly made applesauce for her family of five and it made me remember the days of my childhood when I grew up eating homemade applesauce. Those wonderful days of opening the mason jars filled with pink hued and delicious applesauce made from the efforts of my mother came to mind. Since I had already learned the water-bath canning method of preserving home grown tomatoes after planting 43 tomato plants that first year in our garden, I decided to start making my own applesauce as well. Homemade applesauce is so much better than the canned or jarred varieties that one typically purchases in grocery stores. One can adjust the sweetness and any flavorings to one's taste. Thus my making of homemade applesauce was launched thanks to my neighbor Char, and also with gratitude to my grandma who had given us her canning and food mill equipment that she no longer intended to use. I am also blessed to have an older version of this type of food mill from my grandmother. Making homemade applesauce is so very easy! McIntosh . . . always one of my favorites! Honey crisp or any other combination of your choice. If you have your own apple trees then use whatever type you have. The first video above shows making applesauce in a slow cooker with no water added. Sugar, white, brown or a combination of both. For diabetics sugar substitutes could be utilized. Optional spices such as cinnamon, nutmeg, cloves and allspice. Optional - a dash of salt. 1. Put the peeled, cored and chopped apples into a saucepan. 2. Add the rest of the chosen ingredients and combine with the apples in the saucepan. Add any sugar gradually because it all depends upon the sweetness of the apples one is using as to how much sugar is needed to make it palatable. Do this "to taste." You can always add more sugar later if needed. 3. Stir the apple combination over medium to medium high heat until bubbling. Cover and continue to cook for 15 to 25 minutes until the apples are soft. Stir occasionally during this process to make sure there is enough liquid in the pan. The apples will release their juices as they cook. 4. Take off of heat and process the apple combination with a food mill, a food processor, a blender or even mash with a potato masher or fork if you wish the applesauce to be chunky. 5. Adjust for flavor and put into jars for storage. If too thick the applesauce can be thinned with more water. If too sweet add more lemon juice. If not sweet enough add more sugar while it is still hot. 6. 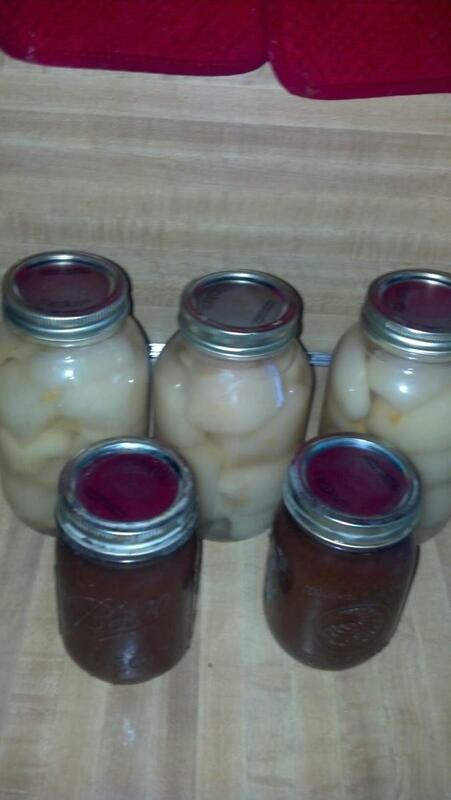 The homemade applesauce can be stored in the refrigerator, freezer or be canned at this point. Exact amounts can be varied depending upon the size of apples and desired sweetness or flavor desired. For 6 pounds of apples you might try using the juice of 1 lemon, 1/2 cup of sugar and 3/4 cup of water as one example. For those who wish to see another person make and preserve applesauce from start to finish, the video below is for you. On our half acre lot in Wisconsin Rapids were a couple of choke cherry trees in our front yard and one in the backyard. Those ripened chokecherries that turned from red to black as they matured attracted many birds who happily fed on them. They also made some great tasting jelly! Once I learned that the chokecherries were edible and also high in antioxidants, I put my grandmother's grinding mill to further use. For those who may not be familiar with the choke cherry, it is related to regular cherries that grow much larger. The taste is somewhere between a concord grape and black cherry flavor if I were to describe the flavor once made into jelly. The large seed in the center takes up most of the room with the flesh of the chokecherry being minimal in comparison. The pea sized chokecherries grow in clusters. After picking the berries, washing them and cooking them in a kettle of water, they were put through my grandmother's old fashioned cone shaped food mill. A huge amount of seeds and skins were collected as that rich dark juice was gathered in the bowl under the mill grinder. We moved several jars of my homemade chokecherry jelly back to Houston when my husband took on a new job assignment. We were able to share them with our family members in Texas. I don't exactly remember the recipe I used, and unfortunately, no longer have access to my notes. Instead, I've included a video that was similar to what I used to make. We enjoyed our four years living in central Wisconsin. I particularly enjoyed my backyard gardening adventures. Learning how to make my own homemade applesauce and choke cherry jelly was fun. I also canned numerous quart jars of tomatoes reaping the goodness coming from our garden and Mother Earth. Looking back I cherish the memories of those days! Have you ever made homemade applesauce or choke cherry jelly? I've made my own homemade applesauce. I've made choke cherry jelly. I have made other jams or jellies but not choke cherry. I've never made either one. 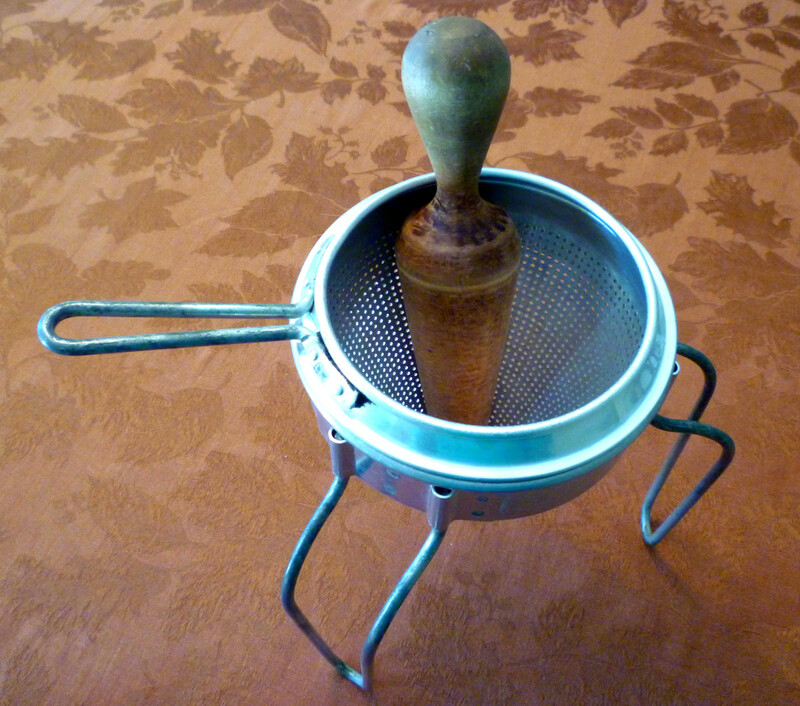 There are more modern food grinders than the one pictured from my grandmother...but yes, they are still necessary for some projects like removing skins and seeds when making jelly for example. When it comes to grinding do you think the old way is still the best way? Just write this in a search engine: Old fashioned food mill with wooden pestle. My article pops up on Google in the #3 position and in the top one (as of right now) are images of ones for sale ranging from $19.99 to $32.19. Hope that helps! How may I purchase the old fashioned Foley a Food Mill with wooden cone pestle? I lost mine given to me from my mother in the 1950's and I love it still. My applesauce is not the same without it. Please help me find one for purchase. Thank you so very much. Happy Thanksgiving to you and your entire family. Nice to remember the meals that your Momma made using her food mill in days of old. Sending good thoughts on the wings of angels your way! Happy Thanksgiving to you tomorrow! Some good cooks are probably using their food mills in preparation for some special foods to be served tomorrow. Appreciate your comment and the share. You know this was a favorite of mine the first time I read it and it still is. 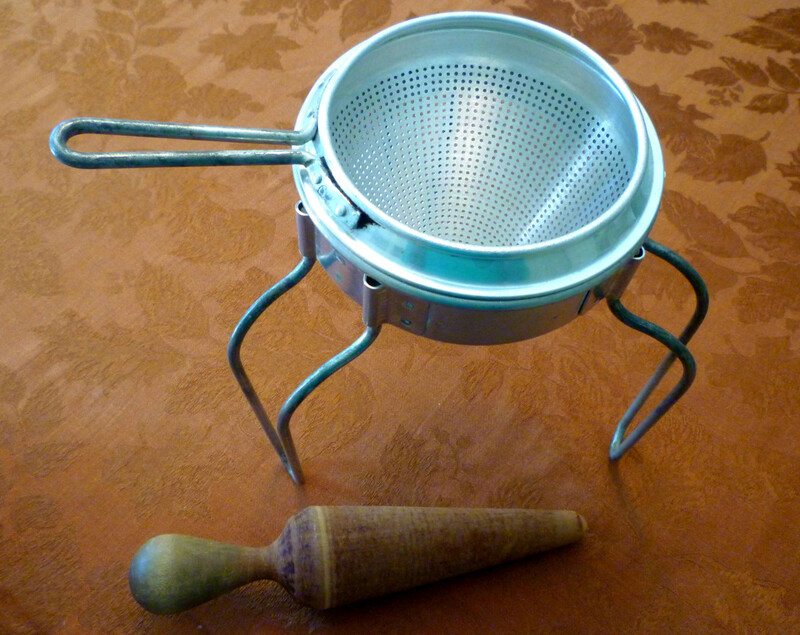 My Momma used one of these to make scrumptious foods for us to enjoy. Somehow it got away from us and I am sorry about. This would be perfect for Christmas dinner and for gifts. Came back to share this excellent article again, especially since it seems perfect for Christmas. The elves need to get busy. Less than a month until Santa arrives! Hope you are well and looking forward to a great Thanksgiving! Nice to be able to tell you what that piece of equipment in your kitchen is used for. Now that you know, will you be making some applesauce or other pureed food? Nice that you also had choke cherry trees when you were growing up. It certainly makes a delicious jelly! Appreciate all the shares. My grandmother's old food mill certainly does a good job! So this is what I have lurking on the back of my pots and pans! Very informative hub! It seems like so many of the 'old' skills are being lost. 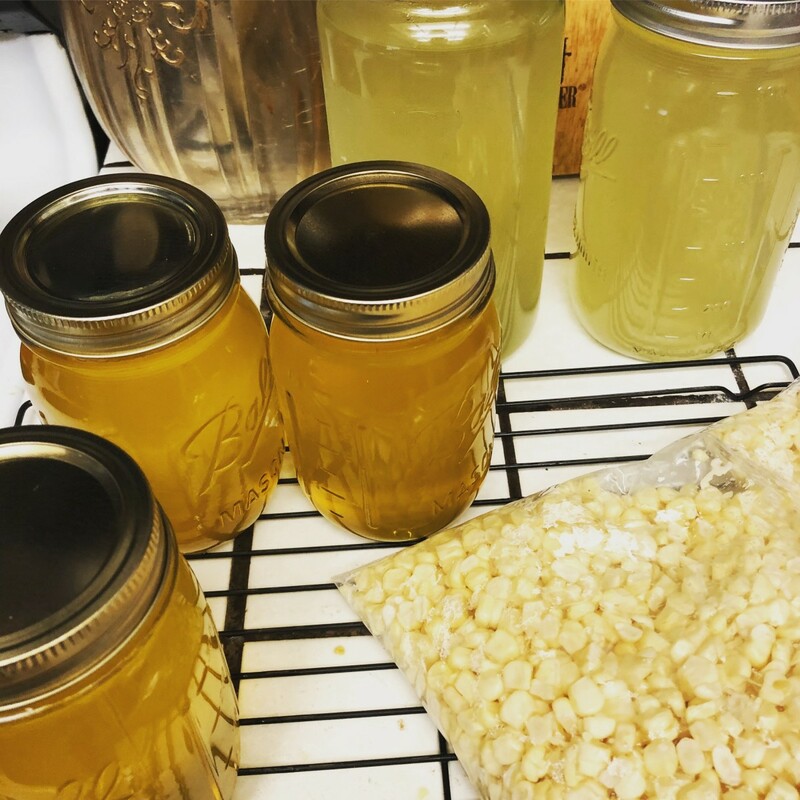 I'm glad to see this article and the videos about the water bath canning method as well as how to make one's own applesauce, etc. Choke cherries may be hard for some people to find. We had choke cherry trees on our farm in WI when I was growing up. 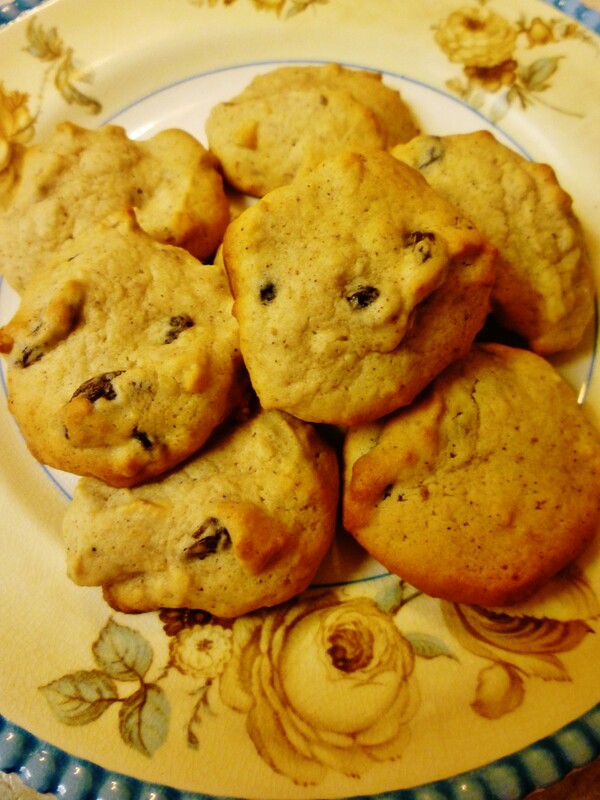 Gave you 5 stars, posted on FB, pinned to my 'Delicious Side Dishes' board, and will share on HP. So glad that by reading this hub about my grandmother's old fashioned food grinding mill you now have the answer to your question about what that wooden pestle's function is. Most of the newer food mills are of the crank variety. Hope you can locate the other part of the food mill that belongs with that pestle. Good luck and thanks for your comment. You just answered one of the mysteries in my house, will share this. The wooden pestle is on a shelf in my kitchen and I didn't know what it was now all I have to do is get the other parts to it. Enjoyed your hub voted up. Actually this old food grinding mill is larger than it may look on these pictures. It does a great job! I always think of my grandmother who gave it to me when I use it. Thanks for your comment + share. Since the old fashioned grinding mill is aluminum, it still looks shiny although it is very old. The wooden pestle shows its age because of the discoloration of using it to mash cooked apples, berrries and such through the sieve for many years of use. Glad that you found this hub interesting. Thanks for your comment. Peggy, this is an interesting hub. The old fashioned grinding mill is impressive and I am surprised that you have kept it in such a good condition. Sieve looks like new. Applesauce is really quite easy to make and you can adjust the sweetness level depending upon how naturally sweet the apples are. Also making jams from fresh fruits is easy with a food mill. They are handy tools to have in a kitchen. Thanks for your votes and the share. Always look forward to your comments. Interesting read and going back in time. Your grandmother's food mill still looks awesome. The videos are useful and really inspire me to try out applesauce canning. Sounds like you grew up much as I did eating lots of fresh garden produce and also that which was preserved for current or later enjoyment during the winter months. Nice! 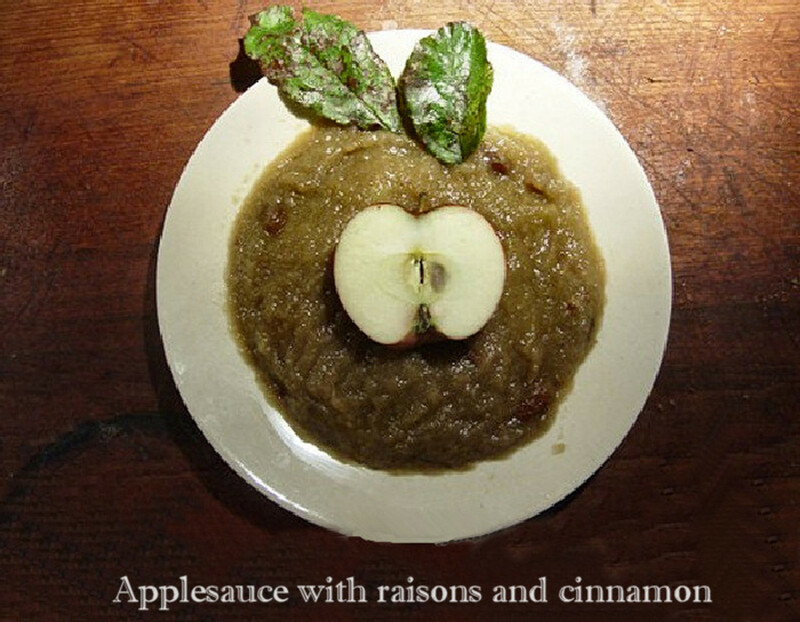 Hope you give the making of applesauce a try. You will undoubtedly find many other uses for a foley mill if you decide to get one. Thanks for your comment. This was indeed a walk down memory lane. My Momma made so many homemade goodies for us from our fields. There were so many times I would come in from playing and find her canning or pickling or using a Foley food mill to squish up a food she would turn into something we could enjoy in the winter or sooner. She did have one of these food grinders like the one pictured but I do not remember her using it so much and now I wonder why. She was not one to take short cuts so maybe it was because of the arthritis in her hands and fingers. Seeing this one today reminded me of those long ago days. Reading this is reason enough for me at least get a Foley food mill of my own and give applesauce making a try. thanks for sharing, Peggy. Like yours, the food mill from my grandmother is also aluminum. That one you located at Lehmans.com looks good. It would take a while to get the wooden pestle seasoned with years of use and lots of jam and jelly making...but it would happen over time. The chokecherries are practically all seed and skin (as you probably know) but they really do make a great flavored jelly. Let me know how you like it if you decide to make some. 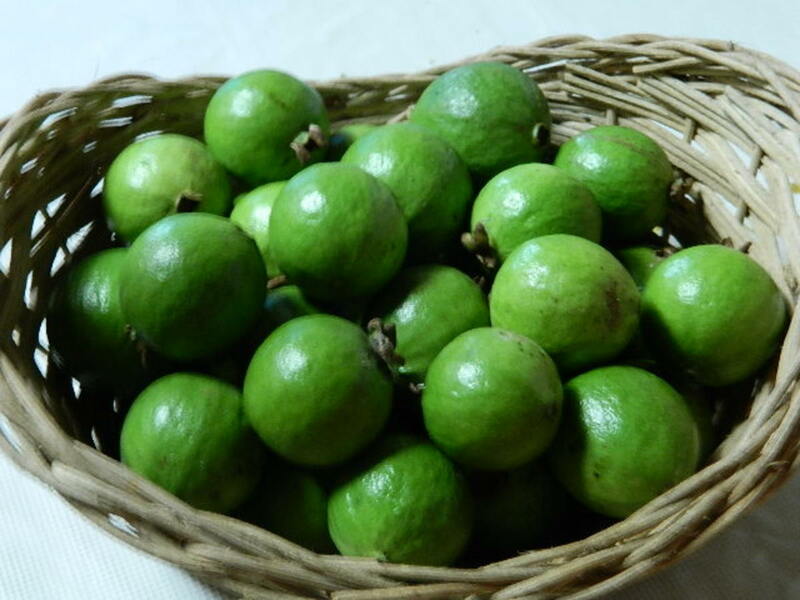 I did not blend mine with apple or other fruit, so it was the pure sweetened flavor. It also has a beautiful rich color. Anyone can contact me at keenone60@hotmail.com. I live in Edmonton AB Canada. Thanks for the advice. I just did a search and Lehmans.com have this same food mill made out of stainless steel (mine is aluminum). Given what we now know about aluminum, I am thinking it may be a wise investment in my health to get a stainless steel one. These cone shaped mills are excellent for making jams and jellies. 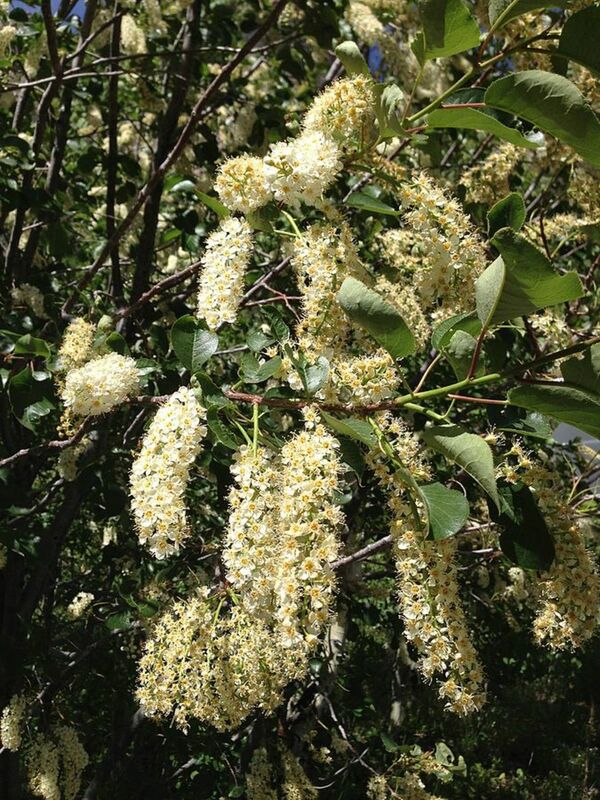 I have never tried to make chokecherry jam but I just might this year. Love your hub page. So helpful. If there is someway to reach you, you might wish to leave contact information in case anyone reading this can point you in the right direction as to locating what you are seeking. I was so excited when I came across your hub page and saw a picture of your old fashioned food mill with the wooden pestle. I have the exact same one that I got from my mother, however, somewhere along the line of various moves I have lost the wooden pestle. Does anyone know where I might be able to find a replacement? I have been making my own jams and jellies for many years and yes, they are a lot more work but the superiority of the taste cannot be matched! We were able to move several pints of the chokecherry jelly back to Houston with us when we were transferred from Wisconsin and the taste is now a long ago memory. Like you, we do not have any chokecherry trees down here. The jelly had a wonderful rich color as well as flavor. Thanks for your comment. I haven't made chokecherry jelly in ages. It is delicious though. When I was first taught how to make the jelly. We were told to make sure and remove every leaf and stick from the mix before boiling the cherries. This was common sense, but I found out later on that the leaves of a chokecherry are poisonous. Where I live now, we don't have any, but I will never forget that year we made chokecherry apple jam. Thanks for sharing this wonderful hub! It brings back memories! I agree with you. It makes me think of my grandmother and the days of long ago each time I see and handle this old food mill that belonged to her. Like you, I have other old kitchen tools that my mother used for years and each time I see or touch them it makes for good memories. Glad that you liked this and thanks for your comment. Nothing really beats old-fashioned. I still have some of my folks' kitchen tools and each time I use any of them, it simply brings me back to a long ago setting. Great hub! Peggy, I love the way you entertwine memories and cooking. It's a very powerful combination. I find the old, hand me down kitchen tools are often much better than the new ones. I hve never had choke cherry jam but hope to someday. This type of old fashioned grinding mill does work great for a number of things. You are lucky if you live where there are choke cherries. It makes a delicious jelly! Thanks for the comment. I have one of these old fashion mills and it works great with concord grapes. It gets out all the seeds and skins so that you can make jelly and juice. Thanks for the recipes! I am definately going to try the chokecherrie! Yes, the applesauce is definitely pink in color when using an old fashioned grinding mill such as my grandmothers because, as you say, the skins, seeds and such are left behind in the cone...but there is more nutrition coming from using the skins. I've often wondered why the applesauce one buys commercially is yellow. Obviously the skins are eliminated prior to processing. Also, as you mentioned, sugar is only utilized if needed. Glad you liked this hub and that it brought back memories for you..."toenails" and all. Haha! Howdy Peggy - Way back in the early 1950s I had the experience of "making" applesauce using one of those "old-fashioned" grinding mills with its wooden pestle. 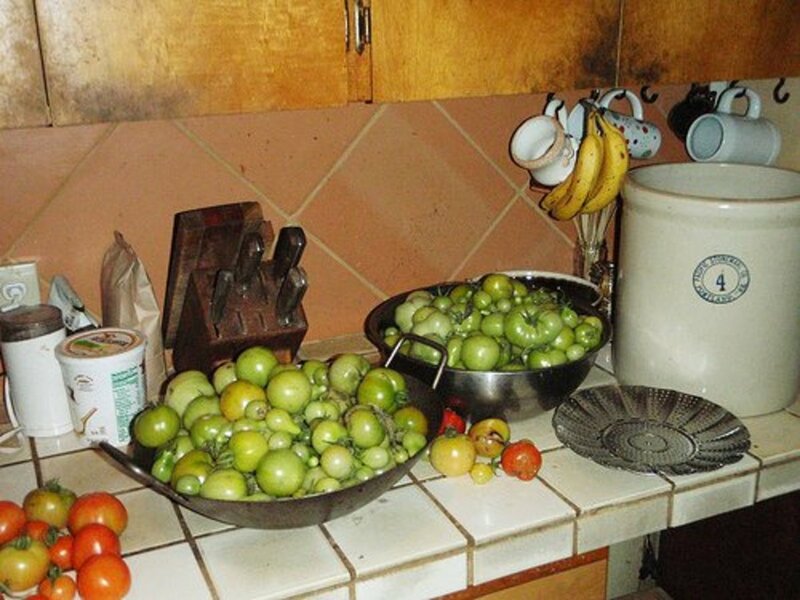 We cooked the hunks of apples, skin, seeds, "toenails" and all, in a waterless cooking pot. Then the whole mess was dumped into the mill and the pestle went around and around. Left behind in the mill were the seeds, the "toenails" and some of the skins, but the rest went through the mill. Did not use any sugar, for the stuff was plenty sweet enough - and it was sort of pink color from the red in the skins. Had not seen one of these for years. Thanks, Peggy. I also had one of those old Foley food mills. Love hummus! Since we have not had a large garden ever since leaving Wisconsin Rapids, I have not had the occasion to do any canning. Now we simply use our freezer to preserve foods made in large amounts like homemade soups, etc. Thanks for the comment. Guess we both appreciate old fashioned things. I too can just look in the mirror! Haha! Thanks for commenting on this hub about my grandmother's old food grinding mill and making applesauce and choke cherry jelly. Are you familiar with chokecherries where you live? Yes, there is something about these old fashioned kitchen tools like this grinding mill of my grandmothers that resurrect memories of past days and the people who would have used them. That old wooden pestle is stained with years of use...applesauce, choke cherries and who knows what else? Thanks for stopping by and leaving a comment. Glad that you liked this hub about using my grandmother's old fashioned grinding mill when I used to make my choke cherry jelly and homemade applesauce. Thanks for the comment. Using up the homemade applesauce never seemed to be a problem! :-) Thanks for the comment. I haven't canned in a long time, so this was a great "refresher" for me. I love the old tools, too, and my favorite is an old Foley food mill, which I just used the other day to make hummus. Very beautiful hub as always Peggy. I love the old tools, especially kitchen tools. Thank you for putting this together. God bless you dear. Great hub and thanks for sharing. Home made apple sauce is great, but you have to use it right up when you open it. It will go bad fast. Home made does not seem to last as long in the fridge after opening it as the store bought. WOW. This is a very rare piece of history. A very fascinating hub and video on the preparation of choke cherry jelly and applesauce. I would love to taste the applesauce and jelly. Great photos of the old fashioned grinding mill. Glad that you found this hub about old fashioned grinding mills and making things like applesauce and choke cherry jelly fun to read. Thanks for the comment. If your parents or grandparents ever made their own applesauce or jelly they probably had one or more old fashioned food mills. I also had the cranking style of one. Actually one would still need some type of a grinding mill to separate the skin and seeds from apples, chokecherries or other types of fruit instead of just using a Cuisinart. Old fashioned or new...food mills still have their place. Thanks for the first comment. I love this Hub - thank you! The stories and the cooking are woven so neatly together and are such fun to read. I'm sure that somewhere along the line we have had food mills without ever knowing what they are.I like jellie but have to go easy on them because of diabetes. Interesting sidelight on country living.My son had an old house converted into a duplex which he bought from his cousin when he was 18. Property values in that area of Minneapolis rose and he sold it at a health profit about twelve years later. He wanted to start his own business and moved to a neighborhood by Lake Dubay and they started a store selling top line second hand clothes while he was trying to start a computer business. The house was on a large lot, had 5 bedrooms(they have 4Kids)and has a lot of Norwegian Pines.Well the economy tanked and he got hsi old job back in the Twin cities and moved to Hudson in a rented townhouse. The point is that he went from urban living, to country living and is now a suburbanite and glad to be away from the expenses and chores of snow removal, lawn upkeep etc.